It was a glorious period that has been termed the days of “wooden cars and iron men.” Today it is difficult to even comprehend the tremendous amounts of energy, manpower and money that went into constructing the Denver & Rio Grande into and across the Rocky Mountains. The courage, determination and sheer guts of such an undertaking are impressively apparent today on the two remaining portions of three-foot gauge trackage out of Durango, Colorado and Chama, New Mexico. By 1883, Palmer’s “Narrow Gauge Transcontinental” mainline stretched 771 miles from Denver to Ogden. The Pullman sleeper-equipped Pacific Express (westbound) and the eastbound Atlantic Express operated on a forty-one and a-half hour schedule and was trailed by “named” parlor cars. Elsewhere, on the Cumbres Pass line in southern Colorado and northern New Mexico, the daily Colorado & New Mexico Express ran in both directions between Salida, Alamosa and Durango, with a helper being added for the 14 miles of steep four-percent grade between Chama and the 10,015-foot summit at Cumbres. A hike along the abandoned grades over Marshall, Cerro Summit and Poncha Pass is sure to bring visions of a small 2-8-0 Consolidation and a diminutive 4-6-0 Ten-Wheeler as they blasted upgrade with an 1890s varnish run. You can almost hear the double header’s exhaust, smell the coal smoke mixed with valve oil and feel the saturated steam as the consist passes. After over 60 years of research and what the late Robert W. Richardson termed “picture hunting”, this book is a pictorial history of the D&RG’s narrow gauge. The Rio Grande Glory Days are preserved here in rare old photographs and art. Climb aboard for the ride of your life as we relive the days when the world and the Rio Grande were young. Almost every quality photograph available from 1873 to 1921 has been included in this volume. 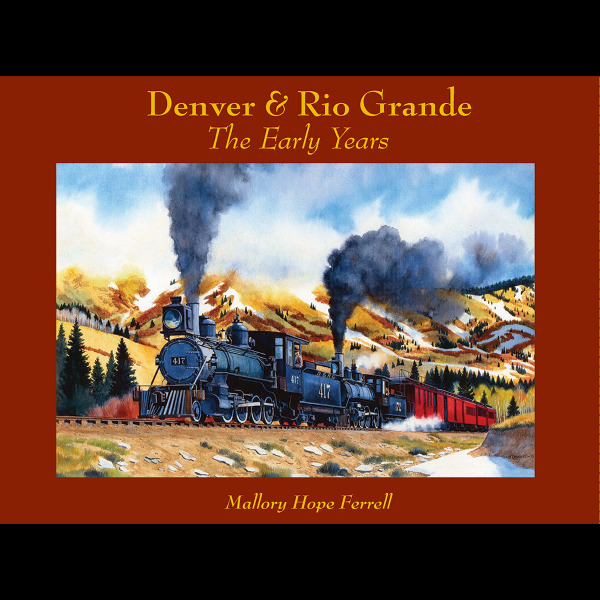 No Rio Grande or early railroading enthusiast will want to be without Ferrell's 22nd (and last) book.